This tutorial describes you about the Ansible Introduction, What is Ansible, Why do we use Ansible? 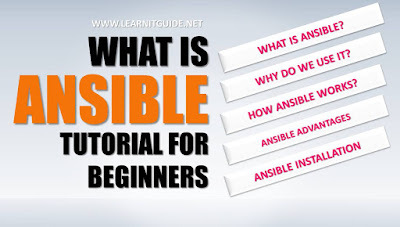 How Ansible works, Ansible Advantages, Ansible Terminologies and Ansible Installation. This will be very useful to the beginners who are interested to learn the Ansible from basics. Ansible related articles something you have missed! Ansible is an open source automation platform. Ansible can help you with configuration management, application deployment, task automation and also IT orchestration. It is very simple to setup, efficient and more powerful. We have lot of automations tools available in the market namely puppet, chef and saltstack. Obviously, each tools has its own features and functionality. 1. Ansible is free and open source. 2. Agentless. Unlike other tools, ansible doesnt require a master client model. which means, no agent to be installed at the client. 3. So how does it work? Ansible uses SSH for the operations on the existing network. 4. System requirement is very low. 5. Devloped in Python. Python is that it is inbuilt into most Unix and Linux deployments nowadays, so getting up and running is quicker. 6. lightweight and quick deployment. Ofcourse its lightweight and its very fast to deployment, becuase it uses the SSH, doesnt have master client communication compare to other tools. 7. Ansible uses YAML Syntax in configuration files. 8. Larger community. Ansible has a large and engaged community of users who can help answer your questions. Before playing with ansible, we should have knowledge of its terminologies to understand the functionality. Playbooks are expressed in YAML format and have a minimum of syntax, Playbooks are the language by which Ansible configures, administers, deploys systems, automate tasks and orchestrates. Playbooks exist to run tasks. Tasks combine an action with a name and optionally some other keywords (like looping directives). Handlers are also tasks, but they are a special kind of task that do not run unless they are notified by name when a task reports an underlying change on a remote system. An action is a part of a task that specifies which of the modules to run and which arguments to pass to that module. Each task can have only one action, but it may also have other parameters. A host is simply a remote machine that Ansible manages. They can have individual variables assigned to them, and can also be organized in groups. All hosts have a name they can be reached at (which is either an IP address or a domain name) and, optionally, a port number, if they are not to be accessed on the default SSH port. A group consists of several hosts assigned to a pool that can be conveniently targeted together, as well as given variables that they share in common. Handlers are just like regular tasks in an Ansible playbook but are only run if the Task contains a notify directive and also indicates that it changed something. For example, if a config file is changed, then the task referencing the config file templating operation may notify a service restart handler. This means services can be bounced only if they need to be restarted. Handlers can be used for things other than service restarts, but service restarts are the most common usage. Refers to running Ansible to perform some quick command, using /usr/bin/ansible, rather than the orchestration language, which is /usr/bin/ansible-playbook. An example of an ad hoc command might be rebooting 50 machines in your infrastructure. Anything you can do ad hoc can be accomplished by writing a playbook and playbooks can also glue lots of other operations together. A file (by default, Ansible uses a simple INI format) that describes Hosts and Groups in Ansible. Inventory can also be provided via an Inventory Script (sometimes called an “External Inventory Script”). So you can define all your hosts in a single file as a Inventory either in the hostname format, ip address or fqdn. Modules are the units of work that Ansible ships out to remote machines. Modules are kicked off by either /usr/bin/ansible or /usr/bin/ansible-playbook (where multiple tasks use lots of different modules in conjunction). Modules can be implemented in any language, including Perl, Bash, or Ruby – but can leverage some useful communal library code if written in Python. Modules just have to return JSON. Once modules are executed on remote machines, they are removed, so no long running daemons are used. Ansible refers to the collection of available modules as a library. A collection of modules made available to /usr/bin/ansible or an Ansible playbook. Many software automation systems use this word to mean different things. Ansible uses it as a conductor would conduct an orchestra. A datacenter or cloud architecture is full of many systems, playing many parts – web servers, database servers, maybe load balancers, monitoring systems, continuous integration systems, etc. In performing any process, it is necessary to touch systems in particular orders, often to simulate rolling updates or to deploy software correctly. Some system may perform some steps, then others, then previous systems already processed may need to perform more steps. Along the way, emails may need to be sent or web services contacted. Ansible orchestration is all about modeling that kind of process. Push mode is the default mode of Ansible. In fact, it’s not really a mode at all – it’s just how Ansible works when you aren’t thinking about it. Push mode allows Ansible to be fine-grained and conduct nodes through complex orchestration processes without waiting for them to check in. By default, Ansible runs in push mode, which allows it very fine-grained control over when it talks to each system. Pull mode is provided for when you would rather have nodes check in every N minutes on a particular schedule. It uses a program called ansible-pull and can also be set up (or reconfigured) using a push-mode playbook. Most Ansible users use push mode, but pull mode is included for variety and the sake of having choices. Roles are units of organization in Ansible. Assigning a role to a group of hosts (or a set of groups, or host patterns, etc.) implies that they should implement a specific behavior. A role may include applying certain variable values, certain tasks, and certain handlers – or just one or more of these things. Because of the file structure associated with a role, roles become redistributable units that allow you to share behavior among playbooks – or even with other users. Ansible can easily transfer files to remote systems but often it is desirable to substitute variables in other files. Variables may come from the inventory file, Host Vars, Group Vars, or Facts. Templates use the Jinja2 template engine and can also include logical constructs like loops and if statements. An optional conditional statement attached to a task that is used to determine if the task should run or not. If the expression following the when: keyword evaluates to false, the task will be ignored. Ansible does not want to force people to write programming language code to automate infrastructure, so Ansible uses YAML to define playbook configuration languages and also variable files. YAML is nice because it has a minimum of syntax and is very clean and easy for people to skim. It is a good data format for configuration files and humans, but also machine readable. Ansible’s usage of YAML stemmed from Michael DeHaan’s first use of it inside of Cobbler around 2006. YAML is fairly popular in the dynamic language community and the format has libraries available for serialization in many languages (Python, Perl, Ruby, etc.). These are the terminologies will be used in ansible. And you will be able to understand more on each things when you are playing with ansible. If you are using a debian ubuntu systems, you can use apt-get to install ansible. If you are using rhel or centos, Enable the extras repos and use yum package manager to install ansible. More topics will be added soon.